Swiss watchmaker Richard Mille recently introduced a whimsical new line of timepieces. The colorful candy-inspired line extends to ten different wristwatch models and is appropriately dubbed the Bonbon Collection. Each of the ten collection pieces is super-limited; Mille has plans to produce just 30 examples of each unit of timekeeping. The watchmaker based the collection on three of its brand’s most recognizable designs: the RM 07-03, RM 16-01, and RM 37-01. While the RM 07- and RM 37-based models were created for the ladies, the RM 16 is unisex. This means there’s quirky Bonbon collection watch for everyone. A few particularly playful designs stand out, and include details like handcrafted, precious or semi-precious miniature fruit, candies, and pastries. The fun looks hide Richard Mille’s emphasis on careful material sourcing and absolute precision, of course. 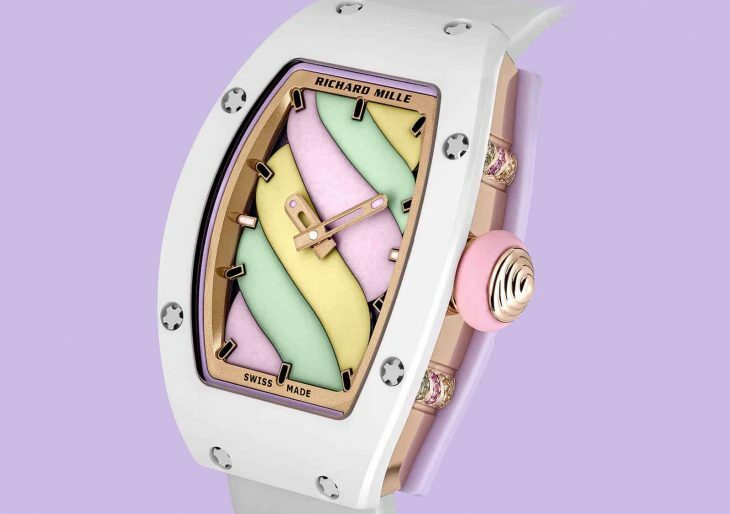 Watches in Richard Mille’s scrumptious new Bonbon Collection series range in price from $122,500 to $158,000.